April 8: Christian Sewing is appointed new CEO of Deutsche Bank. April 15: The European Central Bank (ECB) asks Deutsche Bank to estimate the cost of winding down its investment bank. Thursday, May 31: The Financial Times reported that Deutsche Bank’s US subsidiary was added to the Federal Deposit Insurance Corporation’s list of “problem banks,” or those with weaknesses that threaten their financial survival. Thursday, May 31: Deutsche Bank shares hit an all-time low. Friday, June 1: Standard & Poor’s cut Deutsche Bank’s credit rating from A- to BBB+. The ratings agency also questioned whether Deutsche Bank’s new CEO Christian Sewing would be able to return the bank to profit. Friday, June 1: Deutsche Bank is going to face new cartel and criminal charges in Australia. Friday, June 1: Deutsche Bank shares hit new all-time low. What a difference a week makes, just last week everyone was talking about soaring bond yields. 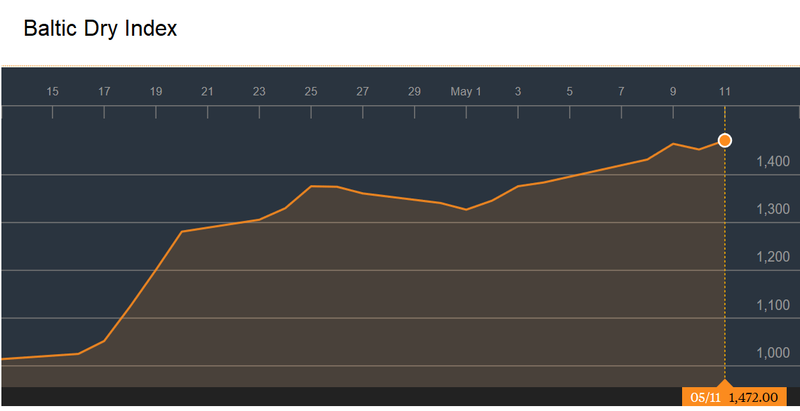 Investors are now seeking safety with developed economies bond yields falling significantly during the week. Here are some 10-year bond yields, figures in brackets indicate change during the week. 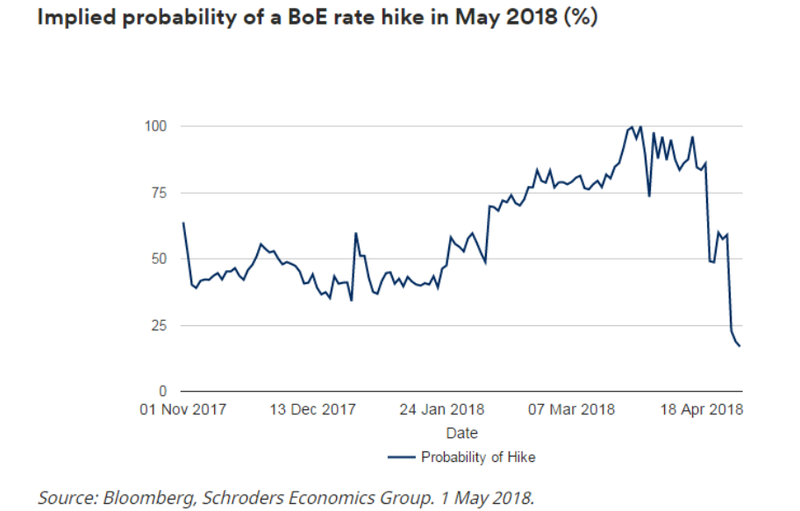 The Monetary Policy Committee of the Bank of England meets on Thursday, May 10 to decide the direction of interest rates. Following a weak UK Q1 2018 GDP growth of only 0.1%, the slowest since Q4 2012 (read here) and inflation falling from 2.7% in February to 2.5% in March (against a Bank of England target of 2%), the market is now pricing in a 17% of a rate rise in May. The market had factored in a 100% chance of a hike just a few weeks ago. The US, the UK, France and Spain all reported GDP numbers over the last week. US real GDP increased at an annual rate of 2.3% in the first quarter of 2018 as per an advance estimate released by the Bureau of Economic Analysis. Read more about it here. Personal consumption collapsed, with vehicle sale falling significantly. Business inventories were up significantly too. Total employee compensation (which includes wages and benefits) rose 2.7% over past 12 months, up from 2.4% a year ago and the highest since Q3 2008, while the household savings rate fell to a multi-year low of 3.1%. The European Central Bank (ECB) via Bundesbank has sold yet another bond issued by Telefonica Deutschland a year after it bought it. The bond which was due to mature in 2021 breached an ECB rule that they should not hold bonds that pay a step-up coupon (one that could go up in value if certain conditions are met – in this case if the company was acquired). Oil prices closed at $67.39 on Friday, gaining 8.6% during the week and hitting a 3-year high. Like we covered here, the impact of oil prices is being felt with oil dependent companies like airlines already seeing margins squeezed. US employers added only 103,000 jobs in March as against 185,000 new jobs expected by economists surveyed by Bloomberg. Jobs have been added for 90 straight months, the longest phase on record. January’s job addition number was revised sharply downward from 239,000 to 176,000. Wage growth was 2.7% which was largely down to tax cuts driven wage rises earlier during the year rather than real wage inflation. Any addition under 80,000 new jobs a month would cause the unemployment rate to rise. As we covered earlier, unemployment has always hit record multi year lows on an average 6 to 12 months before the start of a recession.